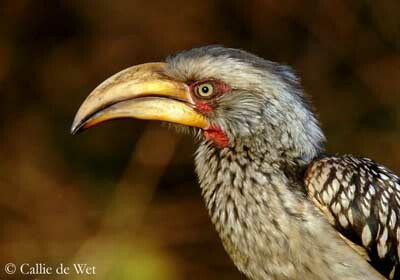 Yellow-billed Hornbill has long yellow decurved beak, males with a casque above. It has bare red skin around and below eyes, at the base of the bill. Eyes are yellow. It has dark grey forehead and centre of crown, extending to the nape. Head sides are whitish. Short strong legs and feet are dark grey. Upperparts are black, heavily spotted with white scales on the wings. Back, rump and long tail are black. Flight feathers are greyish brown, with white edges. Underparts are paler. Neck is white spotted with dark grey, upper breast is slightly streaked black. Belly is white. Undertail coverts are white. Female lacks casque on the beak. Yellow-billed-hornbill has loud call. Its calls include whistles, grunts, cackling and gritting. We can also hear a hoarse and rapid “tok-tok”. 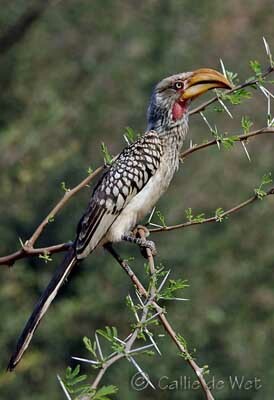 Yellow-billed Hornbill lives in dry thorn fields, deciduous woodlands, and scrubs. Yellow-billed Hornbill is found in Africa, from South (coast to coast) to Northeast. Yellow-billed Hornbill feeds mainly on the ground. It forages for seeds, insects, spiders, but also scorpions. It may catch snakes, which kills beating them strongly on hard surface. It swallows the whole prey, and rejects indigestible parts. It hops on the ground in heavy manner. It can be very tame in parks and reserves, and it is often sighted along roads. 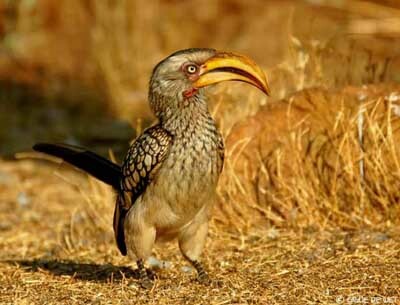 Yellow-billed Hornbill is seen solitary, in pairs or small groups. When calling, bill is pointed downwards and wings are raised. It is active during the day, but mostly at dawn and dusk. It roosts high in trees during the night. Yellow-billed Hornbill has strong flight, alternating brief glides and series of slow wing beats. Yellow-billed Hornbill nests in a hole in tree. This cavity is lined with dry grasses and leaves. Female lays 3 to 4 white eggs in closed cavity. Incubation lasts about 25 days, by female alone, fed by male. Chicks are fed by female in the hole during three weeks with regurgitated food. Then, female leaves the nest, and young reseal the hole themselves. They stay 40 to 45 days more in the nest, fed by both parents. When they fledge, they perch a few days in the tree on the nest site, moving their wings before to take off. They reach their sexual maturity at one year. This species produces only one brood per year. 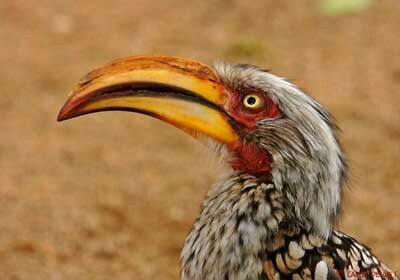 Yellow-billed Hornbill feeds on insects, rodents, fruits and seeds, sometimes snakes, lizards and scorpions. 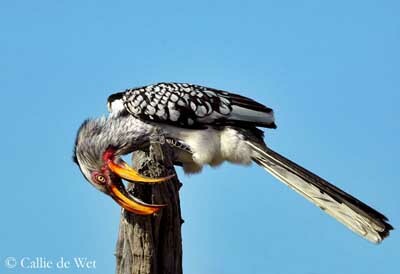 Yellow-billed Hornbill is common and widespread in South Africa, in National Kruger Park.